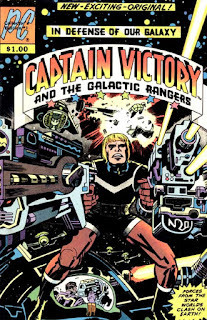 This was a great episode as Captain Victory is a guilty love of mine. I only learned of him in the last decade when Dynamite came out with their Kirby inspired books. Sterling Gates was announced as the writer so I was in. A couple of years later, I ran across a nice brick in the buck box and picked them all up. As you say, this is Kirby at his craziest. If anyone needs an editor, it’s ‘late in the game’ Kirby. There is a plot in this series but it is lost in the insanity. Still worth reading and looking at but it is madness. Loved hearing your take. And definitely worth a quarter, if not 4x that. And I also would add that the Gates book is definitely worth it and probably lurking in cheap bins too. Nice. I will definitely keep my eyes peeled for more of the good Captain, from any and all runs.